Definitely better than the second film, and not nearly as funny as the first, this one is an okay and somewhat enjoyable movie. 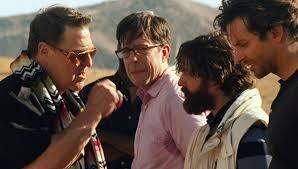 The Hangover III is a fine movie. That means it’s enjoyable and fun, but nothing amazing. No surprise there. the first movie was the best, and there’s no way that any sequel is going to beat it. That’s because the first movie had good humor going for it every step of the way. This sequel is more plot based than anything else. It comes up with some clever ideas for ways of bringing the guys back together and putting them on another mission, while at the same time not being a carbon copy of the first film (the way the sequel was.) basically, this movie is as good as could be expected without being extremely funny. It’s entertaining and the characters are fun, and that’s really all you can ask for. 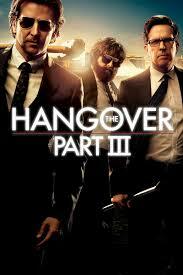 The Hangover Part III is surprisingly a pretty decent film. People like to rag on this series, saying it was the first movie that was great and should have never been made into a trilogy. I disagree. Even the second film, which was undoubtedly the weakest of the three, wasn’t all that bad. Sure, it basically took the events of the first film and transported them over to Thailand, but nothing was exactly the same and the characters were really just acting in similar ways, doing the same kinds of things. That’s why Alan would drug the group again and crazy situations would ensue. The third movie is smart enough to veer away from that formula which made the second movie feel to many people like a carbon copy of the first one. The thing that seems to be missed by all the naysayers and hangover trilogy haters, is that it’s not so much the situations these guys get in, which make the movies good, but the characters themselves. These are fun characters and their interactions with each other are a blast. Yes, the first movie had it all, including a great plot and real sharp humor, but you can’t compare every film in a trilogy to the first one. The first movie is where things are fresh and original and by definition a sequel cannot be that way, without alienating people who enjoyed the first film. The Hangover Part III makes a bunch of smart decisions from the very beginning. The first of these is to not make it about a wedding. Nobody is getting married this time, and there is no bachelor party. There’s also no night of partying, no getting drunk, and no hangover the next day. All of these things work in the movies favor. So does the setting, which is once again Vegas. Anything this movie can do to remind us of what made the first movie so great, really works to its advantage. This movie is smart enough to know that, and so it constantly drops references to that first film, connecting the pieces and showing us the other side of things that maybe we didn’t realize or know about that first time around. the story of this movie is built around our three characters knowing leslie chow (Ken jeong.) this is a guy who are three heroes met in the first movie, became friends with in the second, and now must deal with the repurcussions of that friendship in the third film. the movie doesn’t make chow the main character or anything, but makes him the catalyst for the events that will transgress during the course of the film. it’s not so much about piecing the events from last night together, here, as it is about finding chow and getting their friend, doug, back. i like how this movie found another way to separate the doug character (who always goes missing in these movies), without giving us a mystery about where he is. this time, he is kidnapped and held hostage by the bad guys. he’s the “they killed kenny” from south park, of the hangover movies. the whole thing starts with the boys taking alan out to a rehab center. the guy has finally lost his marbles, which is funny, because he really isn’t that different from the ways he was in the other movies. but now, with his father dying, alan has hit a new low and so the guys have an intervention and then decide to all pile in a car and drive him off to rehab. that’s when their car is attacked and they are kidnapped and brought to a remote location. their kidnapper is marshall (played by john goodman,) a character who was briefly mentioned in the first film. we get to see a flahsback to that to remind us and help connect all of the dots. marshall wants chow. he and chow are lifelong enemies and apparently the problems between them really began with the last time this wolfpack (what the guys call themselves) were in vegas. they bought the wrong kind of drugs from a dealer. the dealer (black doug, as they call him, played by the great mike epps), worked for marshall, and somehow chow got wind of marshall and started targeting him. not long after that, chow stole a ton of money from marshall, fled to thailand, and got himself arrested before marshall could ever get it back. now, chow has escaped from his thailand prison and is on his way back to the stated. alan is his only friend, and so he has been texting back and forth with alan and made plans to meet up. the meet up is going to happen in mexico, and marshall wants the boys to get him chow. he is holding their friend doug hostage until they do. i like that the movie doesn’t just become about finding chow, with them not finding him until the end of the film. instead, they do find him pretty quickly, and begin working with him. chow convinces them that the money he stole from marshall is hidden in his former house, which has now been repossessed and then sold to another owner. that owner is away right now and doesn’t even know the money is there, hidden behind one of the basement walls. chow convinces the guys to break in with him and retrieve the money. they go along with it, and pull off the robbery. not long after that, chow has disappeared again and they are hit with a pretty big surprise about who they just stole from. the movie now becomes about them finding and following clues to where chow went. this means that like the first movie, they need to interview characters and try to get answers. they show up at the house of a character from the first film, the stripper played by heather graham. she’s a welcome face, just like having mike epps back, and she points them in the right direction. that direction is vegas. i love the idea of bringing cast members back, and appreciate having these two, but a few more would have been nice too. between the doctor, the wedding officiant, rob riggle as a policeman, and mike tyson, there were plenty of faces this movie could have got to written. the big problem with this movie that separates it from what made the first film so great, is that nothing outrageous happens. sure the guys find themselves in some bleak situations, like breaking into a house, but the first movie had them get into things that were ridiculously fun. there was the stolen police car that they drove around in, the kidnapped tiger, and even a scene of them getting tazered by the police as part of a demonstration for kids. that movie wasn’t all about plot, and instead decided to take time outs from the plot to just give us genuine funny moments. that police tazering scene, for example, in no way furthered the storyline, but it happened to be one of the funniest scenes in the film. this third movie doesn’t share the same mentality, and instead it focusses too hard on its plot. the characters and their relationships are still great, but the drive to have fun and put that as a priority ahead of all others is not really there. maybe it’s because the second movie did that and got caught with it’s hand in the cookie jar, as people shouted at it for not being creative. that movie featured a drug dealing monkey as well as transvestite prositute. it went a little too far, whereas this third movie doesn’t go far enough. by the final portions of the film, there are some pretty fun moments, like hanging off the side of caesar’s palace, but it’s a little late to start getting exciting at that point. this movie is definitely entertaining, but it never reaches the same levels of humor as the first film did.